We’ve been told the same thing for 60 years: To get more return in your portfolio, you have to take one more risk, right? That’s modern portfolio theory, proposed by Harry Markowitz in his 1952 paper, “Portfolio Selection,” and has been generally accepted as investment gospel. Investors obligated to meet certain liabilities and commitments face a conundrum. Equities can provide the potential for the capital appreciation that investors need to help them meet their financial obligations, but also can have wide, varied price movements (volatility). Additionally, with interest rates at generational lows, investors have sought equities in greater numbers. But that will undoubtedly introduce additional volatility and downside risks to a portfolio. WT Wealth Management embraced a change that was taking the industry by storm during the 2008-2009 market downturn and extensively researched adding equity exposure through an allocation to low-volatility (low-vol) ETFs. Some investors may not fully appreciate this strategy’s benefits. For many decades, investor unease with equity risk has not been addressed by traditional investing strategies that have been focused more on following market benchmarks than on managing return volatility. Moreover, WT Wealth Management’s low-vol emphasis provides capital preservation, which sets us apart from other managers that do not target downside protection. Coming out of the 2008 financial crisis, interest in low-vol strategies has grown. As the economy recovered, a cataclysmic tilt to investments besides mutual funds occurred, and the ETF (exchange traded fund) industry was built from the ruins of the prior bear market. A low-volatility equity strategy tries to exploit one systematic factor—price volatility—to encourage investors to build a portfolio with the lowest volatile stocks. If you do that over a long period of time, you should be able to get at least market-type returns without wild swings. Investors usually pay little attention to these “unloved stocks”—stocks you know exist but rarely make the front pages of newspapers. Traditionally these stocks have been in the consumer staple, healthcare and utility areas, but not always. Low-volatility portfolios are trying to capture this anomaly, which can exist within other sectors as well. Basic math shows that it is so much easier to recover from a small loss than a large one. Wild rides are never fun unless you are at the amusement park with the grandchildren—and even that’s debatable. The chart below highlights that, while a 20% loss may not be any fun, it requires a 25% to break even. On the other hand, a 50% loss requires a 100% return to get back to your starting point. It could take a decade or more to recover from a 50% loss. Low-volatility strategies appeal to many investors in or near retirement, since many of them are trying to “de-risk” but still grow their nest egg. If they can get at least market-type returns for less risk, why wouldn’t they do it? At WT Wealth Management, we believe that low-vol funds have the advantage of allowing investors to stay committed to the markets, where they might otherwise have exited them early or moved more into fixed-income investments. 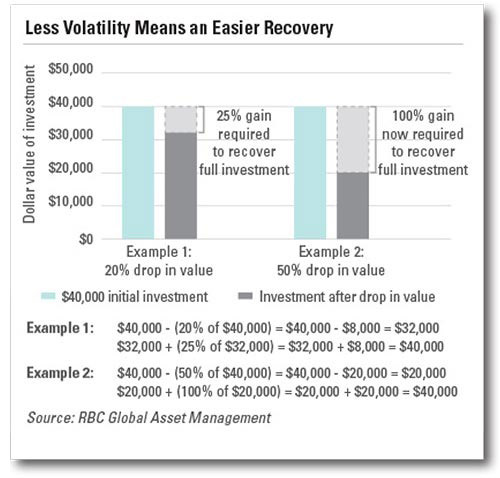 The sensible option is never to take a 50% loss, and to manage your downside with lower volatility investments. At WT Wealth Management, we always believe in constructing the “core” portion of the portfolio with lower-volatility equity strategies. For this can reduce the risk of their portfolio without dramatically changing the return profile. The returns of lower-volatility strategies tend not to resemble the traditional benchmarks. If you need to compare returns on your equity portfolio to those of an index everybody chooses as a benchmark—for example, the Standard & Poor (S&P) 500—then you might be confused if you invest in a very, very different strategy. Low-volatility equities would be one of those. However a low-vol strategy can sometimes handily beat traditional benchmarks such as the S&P 500. 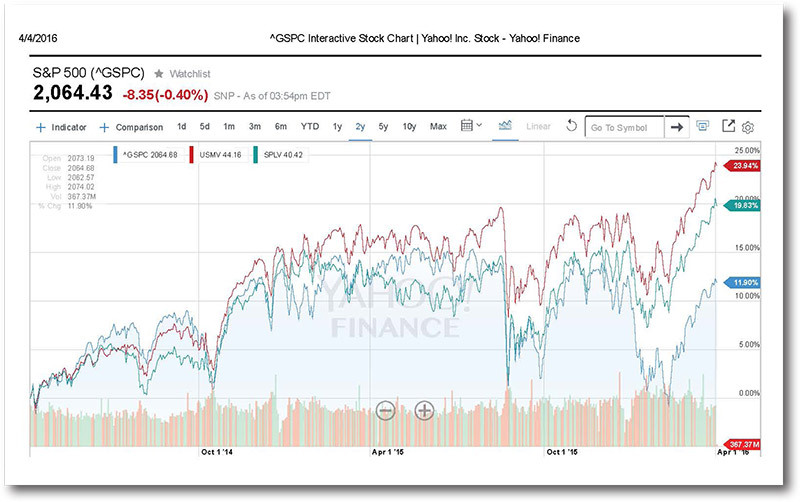 A popular low-vol ETF, the iShares Minimum Volatility ETF (USMV), has beaten the S&P 500 (GSPC) over the last two years by a wide margin. As of April 4, 2016 the S&P 500 has returned 11.83%, while USMV has returned 23.94%. SPLV, another popular low-vol ETF offered by Powershares, has returned 19.83% over that same period of time. With traditional mandates, most managers aim to outperform a benchmark while undertaking a similar level of risk, but often end up taking far greater risk than the benchmark in order to beat it. Yet, in most low-vol mandates, mangers aim to generate a return like the benchmark with 25-35% less risk. This risk-return profile for low-volatility products resonates with many investors who cannot bear large losses. To meet future liabilities and income commitments, investors must grow their assets at a rate high enough to meet their obligations. While equity investing can be a strong option in these instances, many investors are put off by the potential downside risk that large equity allocations can introduce to a portfolio. In these circumstances, low-vol equity investing can be a compelling alternative—reducing downside-risk potential while making little compromise on long-term returns. 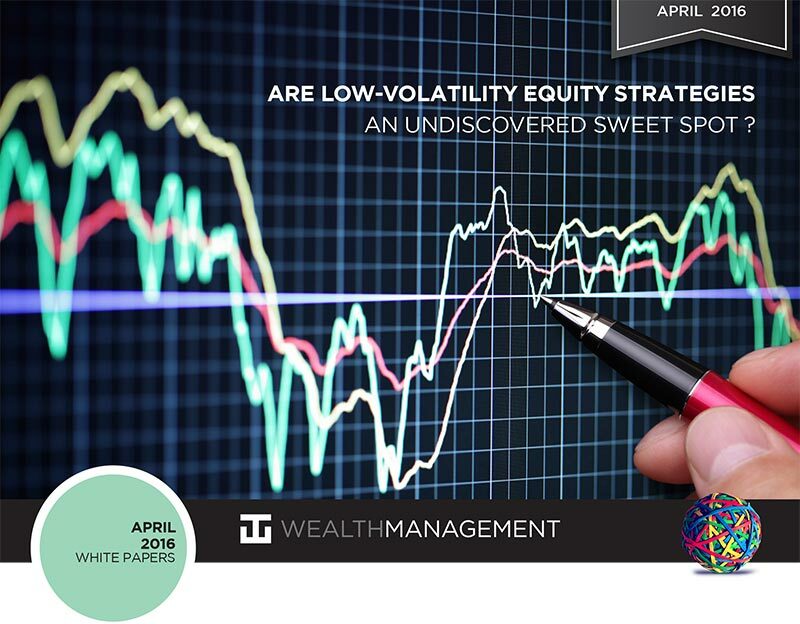 At WT Wealth Management, we feel strongly about the low-volatility approach. We have built our entire business around it. The current uncertain global macroeconomic environment is only adding urgency as everyone remembers the destruction of wealth in 2008 and 2009. As we have hopefully demonstrated, the risk/return payoff is compelling and offers crucial volatility discounts. We believe that strategies seeking to diversify risks along different risk dimensions actually neutralize currency volatility, minimize trading costs, and seek to improve returns over a full market cycle.